“It was unbelievable, worse, it was Wellsburg who had finally stopped the Blue Wave’s continuous roll.” The game was a series of punts and fumbled balls. Once Follansbee had the ball on the two-yard line, but could not score. 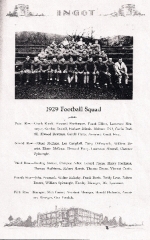 Coach George Roark’s 1929 football team was one of the finest in the school’s history. The team scored 211 points to their opponents 24. 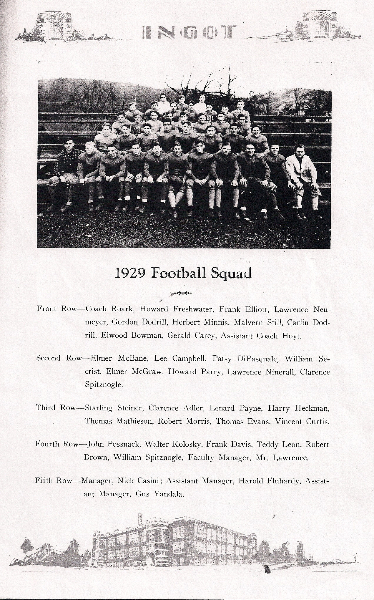 Team captain Herbert Minnis played quarterback. In the Weirton game, Minnis intercepted a pass for a 6-0 Blue Wave victory. Others included Carlin and Gordon Dodrill, who fought hard for the center position. Elwood Bowman and Melvern Still were tackles. 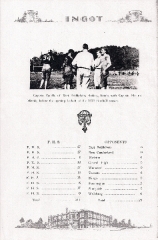 Gerald Carey, who played end, was picked for the All State team. Frank Ellliott and Howard Freshwater held the guard positions. Lawrence Ninerell and Lawrence Newmeyer were halfbacks. The fullback spot was alternated between Patsy DiPasquale and Lee Campbell. Ingot (Follansbee Yearbook), 1929, see “Football” section. Weirton Daily Times, “Weir, Follansbee to Meet for 14th time on Gridiron,” September 12, 1939. p. 6.